Another five star read. Is anyone surprised? And not a typical second book. There were new characters and unexpected twists to give this story a life of its own. My biggest complaint: I want the next installment NOW! I really liked the premise of this super hero story before it began to be explained more (in this book). The parts about realm-shifting and such are more than I bargained for when I picked it up. It is feeling much more like science fiction as we get further in. I'm not crazy about the end of this book - just like I didn't feel happy at the end of book one. However, I'm vested in David's plight. I love him. He's a quirky character who keeps growing and changing as life happens. I don't like to give things away in my reviews, so I won't delve into the disasters encountered in this segment of the story. Suffice it to say, I was glad David was in New York City (Babilar) so the team that got creamed wasn't the lovable Abraham or Cody. If you idolized Prof (like David), prepare to get an eye-opener. If you like meeting new epics, you'll be thrilled to get a number of nasty intros to seemingly soulless High Epics and a surprise about the origin of all the powers. 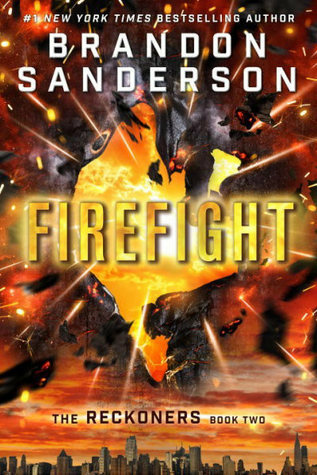 Sign into Goodreads to see if any of your friends have read Firefight. 30.53% "This starts right when a big problem arises for the Reckoners, rather than right after Steelheart ends. I'd rather be reading it than doing anything else, if that tells you anything about it. (Nothing surprising, though, since Sanderson is a pro.)"